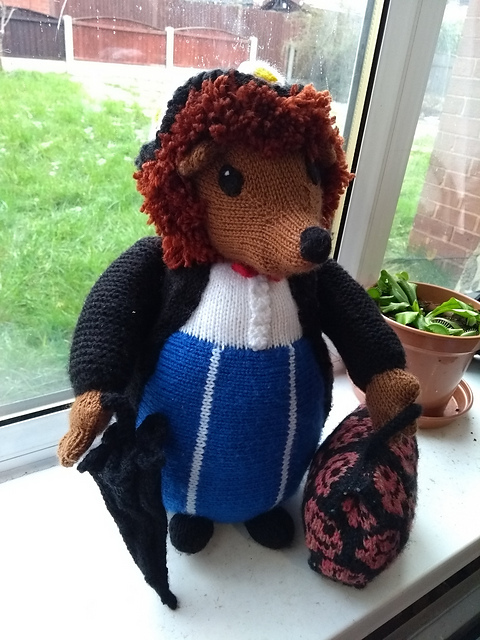 Is it Mrs Tiggy-Winkle dressed as Mary Poppins, or Mary Poppins reincarnated as a hedgehog? Crumble looks so cute in that hat! Carpet bag! Not an exact replica by any means, but it’s still cute! And who could forget the umbrella?! 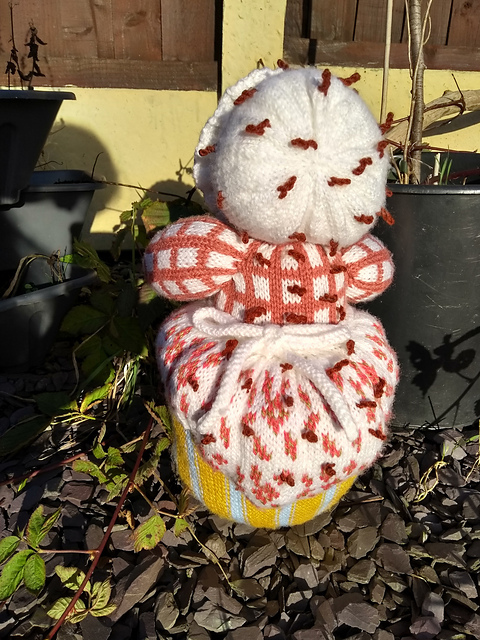 For this one, I used the free pattern Quick Mini Yarn Parasols by Amanda Williams, but added extra stitches and worked it on larger needles. It was a big project, and took a fair bit of time, but I’m really pleased with it. I hope Rabbie likes it as much as I do! In preparation for a trip to Disneyland Paris we’ve been working through classic Disney movies with the little terrors, and Engel, as he hasn’t actually seen most of them, but anyway! 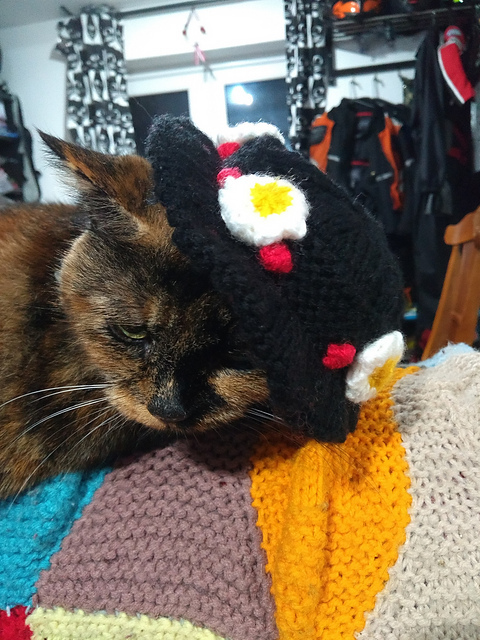 Cheshire cat hat of adorableness! 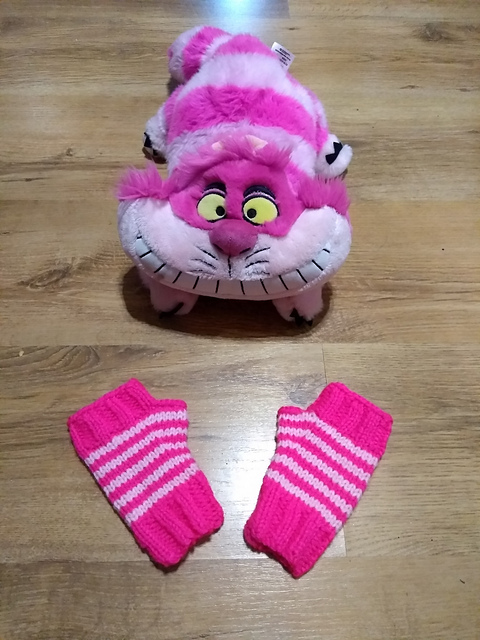 Cheshire cat arm warmers of adorableness! Aviator arm warmers of adorableness! Well, it’s been a busy week with work and family visiting, so I shall leave it at that! Anyhow! Let’s start with Biggles. 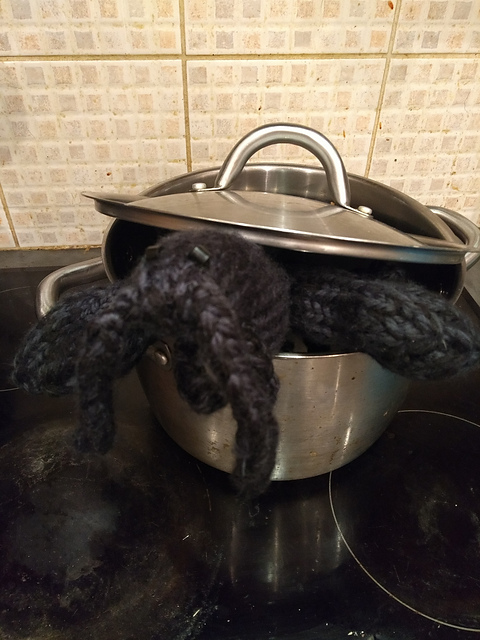 Ages ago, I knit Inkling an Aviator hat, which, from the moment I first put it on him, has been referred to as the Biggles Hat. This hat has been excellent with the cold weather, and it’s super cute. 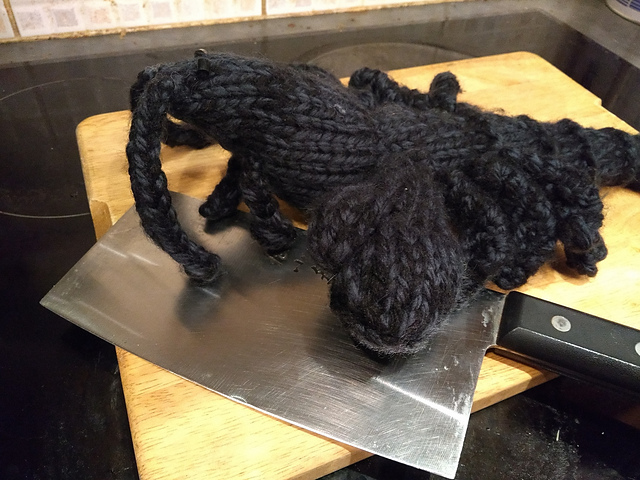 So, moving on, we have a but of a tradition in my little household where everyone gets a gift on Christmas Eve which is of the warm and wooly variety so that they don’t get eaten by the Yule Cat. Seriously, it’s a real thing! Such a beautiful, serious face! Isn’t she adorable in it? More of that on her blog! And possibly the only knit that I’m more proud of the back than I am of the front! 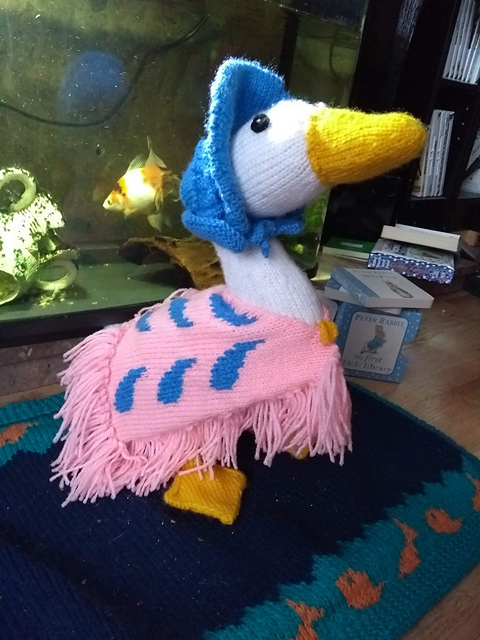 Out of all the Alan Dart Beatrix Potter knits that I’ve done so far, she is definitely the most complex! Especially those FIFTY quills individually sewn onto her bonnet, back and bustle! Now onto the next project – one I definitely need sunglasses for! The pattern is very loosely based on the free pattern Pignoli by Berroco Design Team ‘ the pattern calls for knitting a large panel then felting it, seeing as my neon orange was acrylic, I reduced the number of stitches and skipped the felting. I also added a flap and handle to keep the darts secure inside and to make it easy to carry. I like the rib effect as the more full the bag gets, the more you see the orange! Felix has already informed me just what colours she wants her Nerf dart bag to be so she has somewhere to store her darts…she’s as bad as her daddy! Playing Arkham Horror with friends and eating far too much to bring in the new year, but putting up a quick post in a quiet moment as I don’t know when I’ll see the next one! As mentioned in my last post, I’ve been visiting the family and staying with Rabbie, there’s been dog walks, Nerf Battles, Christmas, Butterfly World, and the drive back and all the cleaning and tidying to do as well! It’s been constant. Its a Nerf dart, to commemorate the Nerf craze that has hit our house, and subsequently my family, pretty hard! That aside, it’s been a very busy year and I have a few resolutions to try and make next year better. The wool count will continue (this week I’ve used two balls but gained four at Christmas) and I’m going to try and slowly declutter the house. I’m also going to try and take a moment every day to think about something positive, and hopefully this will improve my currently rather pessimistic outlook on life! I’m aiming to be a realist, optimistic is a bit too high an aim, for now. May you all have a good new year and an excellent start to 2019! Joking aside, I’ve picked up in my Beatrix Potter knits again and decided to start with Jemima so I would have the full cast for when Felix and I are acting The Tale of Tom Kitten…this pattern, like the others I’ve made, are the ones created by Alan Dart and after a request the other day by someone trying to find the patterns, it appears that they are completely out of print, you can’t even get them from the Alan Dart website…so if anyone does want them, eBay or Amazon are my only suggestions. Edit: she finishes her blogpost about today! I’ll see you after Christmas! Have a good holiday no matter what you celebrate! This was one of those spontaneous projects that occurs due to events or circumstances far beyond your control. And subsequently, a necessity to troll a work colleague. 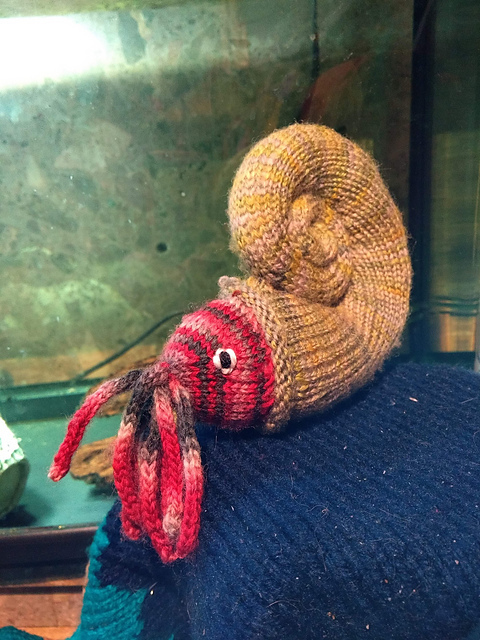 He’s a combination of the fantastic free pattern LaPrawnda the Shrimp by Ashley Dorian Medwig and Crab by Sarah Keen from the book ‘100 Little Knitted Projects’. You want a full body shot? And another close up of that adorable little face? First of all, if this post looks weird/different then it’s all due to a huge WordPress update that has changed everything!!!! After a very fun day I was left with 5 10g lots of Blue Leicester wool which I had dyed all kinds of colours, so what to do with them? 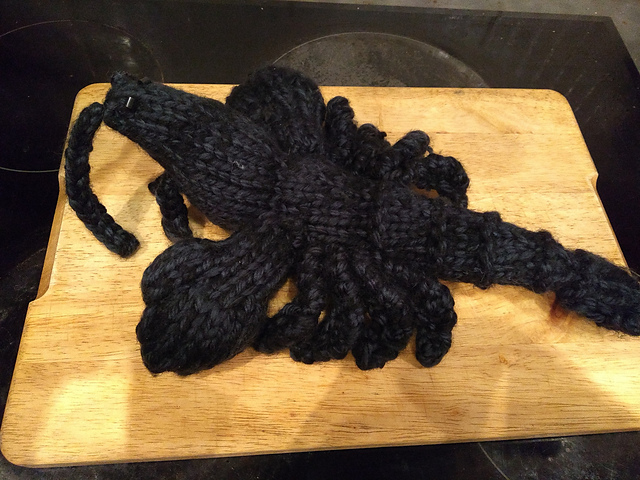 I used every bit of one of my five lots of wool, and a tiny bit of a second for the head and tentacles. Need to have a think of what to do for the other pretties…for now, I’m pleased with what I have achieved! Think if I drop enough hints Engel might get me the dyes for Christmas? Or perhaps I shouldn’t start another hobby? * Famous last words, it’s taken me four attempts and about fourty minutes to type and post this! At least, I think so! 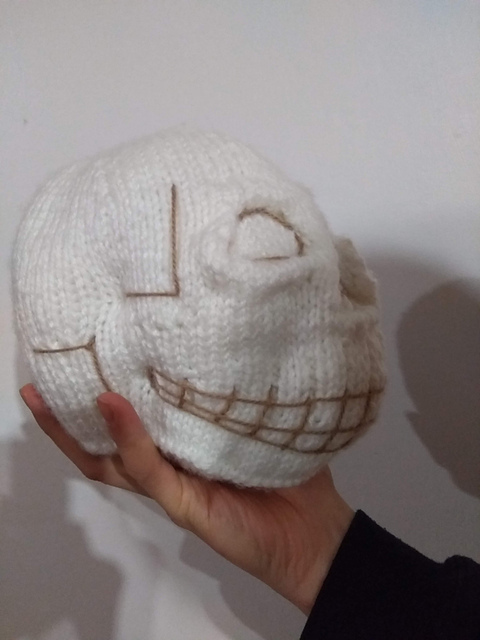 I was given a commission from work for a life sized skull. 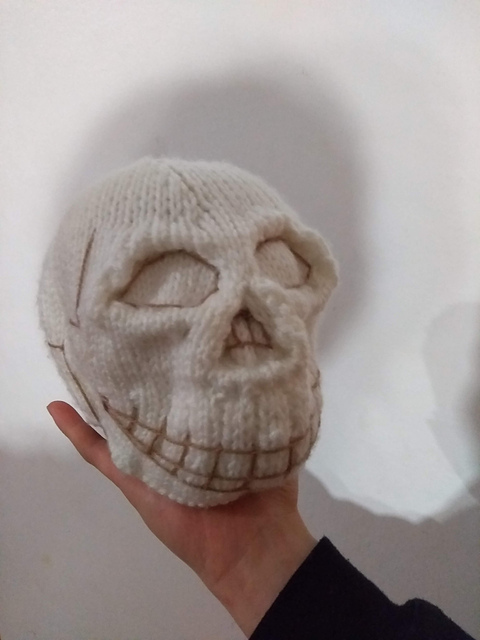 Couldn’t find any patterns for one, even ones to buy, so I made this guy up using photos of human skulls. I think it’s worked out well. What do you think, Yorick? If I was to make him again, there’s a few minor changes I would do, and I’ve noted as such on my scrawled pattern notes. Still nothing to say, Yorick? Short post today, it’s been a very long week and I have a lot to be getting on with, December is always a busy month!